SanDisk today announced a 2 GB 2 Rock Band 2 SD gaming card, significantly increasing the storage capacity available to gamers using the Nintendo Wii console. Rock Band 2 for Wii, developed by Pi Studios under the direction of Harmonix, is fully featured with online modes including World Tour and Battle of the Bands, an innovative character creator, weekly downloadable content and more! 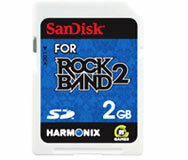 Beyond storing bonus Rock Band 2 content, gamers can use the SanDisk 2GB Rock Band 2 SD gaming card in a variety of applications. Photographers can showcase their photos by filling the card with hundreds of images and then posting a slideshow on the Wii’s photography channel. The SanDisk 2GB Rock Band 2 SD gaming card is expected to be available for U.S. retailers this spring, and carries a manufacturer’s suggested retail price of $12.99.